Yesterday began with an email looking for an eleventh-hour replacement. Four hours later, I was in downtown Los Angeles as moderator of a luncheon panel on Vietnam at the Pacific Council on International Policy. 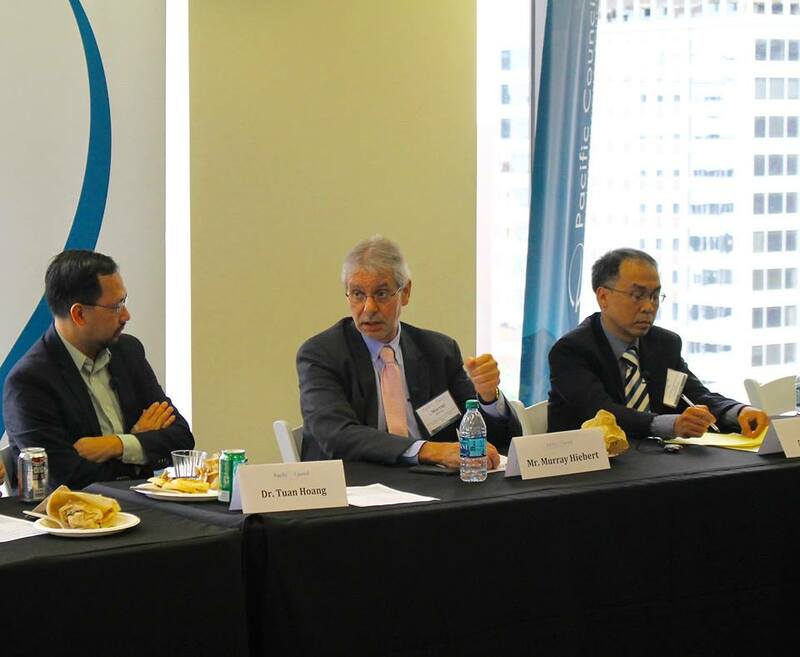 The luncheon was the first in a new series of talks at the Pacific Council, and the speakers were Murray Hiebert and Tuong Vu. They provided an overview on Vietnam today – economy, government, education, relations with China and the U.S., etc. They also responded to a variety of questions from the audience of about twenty-five people in law, business, government, and higher education. It gave me a chance to see Tuong Vu again and to meet Murray Hiebert, a senior fellow at the Center for Strategic and International Studies, for the first time. A former journalist for many years, Hiebert covered Vietnam for the Far Eastern Economic Review from the mid-1980s to the early 1990s. He was also among the first journalists from the West to open an office in post-Cold War Vietnam. But back to Vietnam… Hiebert followed his years there with a book about the country called Chasing the Tigers that came out in 1996. The title reflects the contemporary popular image of the Asian “tiger economy” in Singapore, Hong Kong, and others. I remember reading it years ago, but don’t remember much except that it was among the first wave of non-academic books about post-Renovation Vietnam. Before the panel began, I brought up the book and learned something interesting from its author: he and his agent had a very hard time finding a publisher. In the 1990s, books on the Vietnamese economy and politics were of small interest to publishers, especially non-academic ones. Books on MIA/POW, yes. Books on some other aspect of American involvement in the war, sure. But books on postwar Vietnam itself might not sell. It took a couple of dozens of publishers before they landed one. As reflected by this luncheon, however, Americans today are more interested about the Vietnamese present than the Vietnamese past. I’m not sure if time heals – at least, it doesn’t heal as much as one wishes. But time shifts one’s priorities and focus. American interest in postwar Vietnam has been coming for some time, especially in the late 1990s and early 2000s. It seems that enthusiasm went somewhat overboard and then, for several reasons, dipped somewhat. Perhaps the interest is less optimistic and more balanced and more “realistic” now? In any event, the panel went well. I had a few questions on hand in case the Q&A slowed down – one question has to do with factions in the current communist leadership. But the conversation never slowed down and I didn’t need to ask. It didn’t hurt that the temperature dipped to the 70s after a weary heat wave last week. The drive there was great, and the drive back wasn’t half-bad by LA’s afternoon traffic standard. My appreciation to Lan Chu at Occidental College for the email!